Preamble: This post was delayed by an hour because I don’t have the heart to tell binocular-wearing elderly men at Starbucks that I already know about the various gangs dictating the workings of the New Jersey judicial system. #TheSopranosAreOnNetflix. Postamble: (Get it? Is that a pun?) In the last week my region has suffered an earthquake, tornadoes, and a hurricane. What. The. Hell. I hope everyone got through the East Coast ‘cane safely. We were lucky – despite preparing for a (EARMUFFS) sh*tstorm, we basically ended up with more of a wet you-know-what. (Use your imagination.) I know that wasn’t the case for everyone – we were lucky, and I'm grateful. Anyhow, the Earth seems to be as restless as I am. I’ve been craving something new and different lately. It’s slightly odd, because I do have a tendency to embrace the familiar and hold on to the “old.” I mean, I don’t hoard things…but I do have a seriously old toe ring from Claire’s in my jewelry box, right next to a tarnished “belly bracelet” that I used to wear with a mock-turtleneck crop top. (Yeah. That happened.) But aside from my slight “sassy CrossFit T-shirt” addiction, that’s the extent of it. I maintain no creepy doll collection and I have exactly zero feral cats. So what I’ve really had a bug in my britches about lately is getting a good dose of new flavors. I’m usually happy with a repetitive menu (I’m no cook – have you noticed that this “food blog” is rarely about FOOD? How doeees she do it?) but lately I’ve been needing a dose of…Santa Fe. I love Santa Fe – it is one of the most gorgeous, pedestrian-friendly places I’ve ever been, and the regional hiking is amazing. The food, the colors, and the climate are all unbelievable. Fire-roasted chiles and Georgia O’Keeffe – what more does one city need? This delicious breakfast was inspired by the hungover chipper pre-wedding breakfast we had at the Guadalupe Cafe whilst in SF for a friend's wedding a few years ago. Critical to this recipe is the chile verde sauce – which is AWESOME because it is delicious and ridiculously easy to make. You'll actually cook the eggs in it. The foundation of the sauce, of course, is tomatillo; but you can use a few different types of peppers: Anaheim, legit “New Mexico” chile peppers (if you’re fortunate enough to live there) or Serrano. I chose Serrano. I made this cutting board in 8th grade "woodshop." It looks like a duck. It was supposed to be a square. I really tried to make it square. First, roast the peppers (seeded or whole) in the oven. I put them under the broiler, and they were donesky within about 3 minutes. Watch carefully! Meanwhile, set a pot of water to boil. 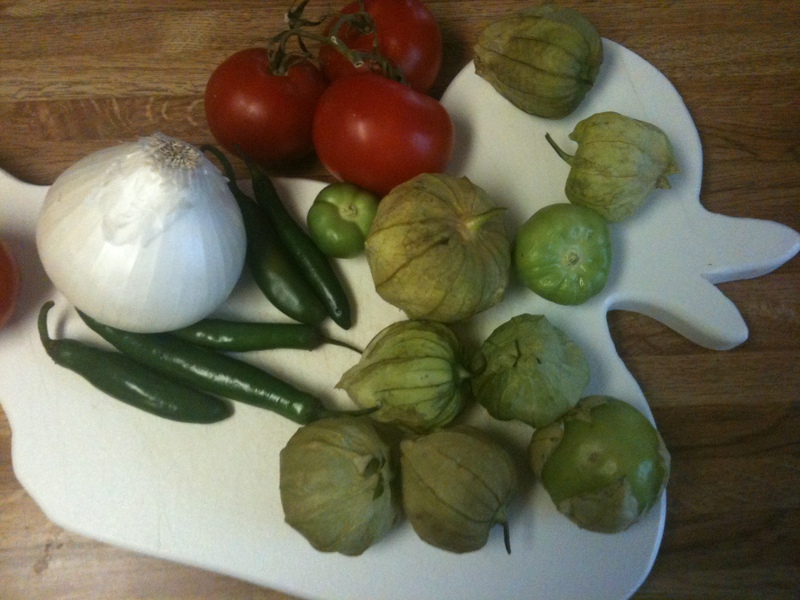 Peel the husks from the tomatillo and boil the naked buggers for about 5 minutes so soften a bit. Now you’re ready for the hard part: Put everything in the blender and puree. Boom – fire-roasted chile verde sauce. Take the fire-roasted salsa verde and pour into a skillet. Bring it to a bubble (which is my technical term for what this thicker sauce does when it “simmers.”) Crack your eggs on top of the sauce (like you’re frying them) and cover so the steam cooks the top of the egg. It won’t look pretty, but it will taste ah-mohhzing. I was going to make these and tell the boys Auntie Liz sent them from far away just for them. But then realized you don’t have our badge on our sidebar. So, now I’ll just claim it for my own. first off, get out of my closet! second, i am totally going to attempt this recipe because i need both a new way to enjoy eggs as well as a taste bud trip, seeing as how there are no real vacays on the horizon. In a similar vein, if you make a curry and you end up with leftover sauce but all the delicious bits of chicken/lamb/hippopotamus are gone, eggs poached in curry sauce is an AWESOME breakfast. Sarah, do you “poach” as in SUBMERGE? 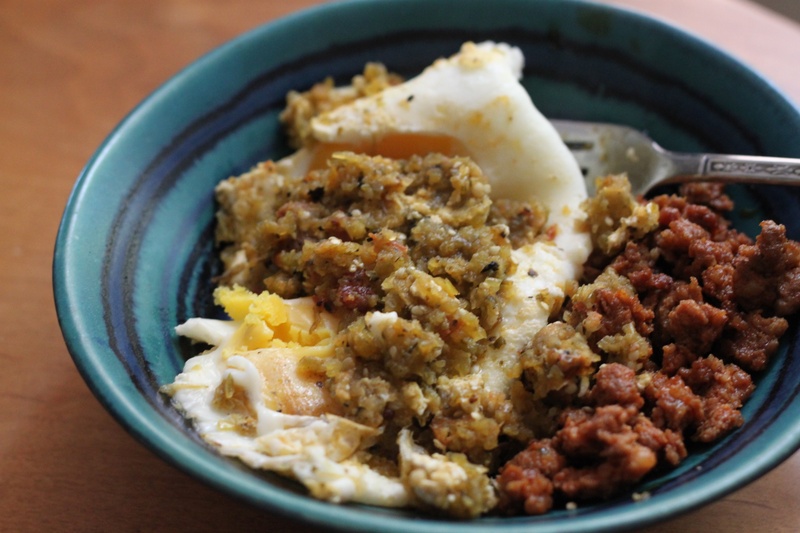 Or do you heat up the leftovers and cook the egg on TOP of the mixture? I was kinda confused about which to do, so I went for the latter option.